It’s easy to get swept up in the newest releases, the hyped-about fantasy debuts, the books nominated for awards – and it happens to me all the time. Last year, I made an effort to not forget about older books, to always read one newer and one older book at the same time, to catch up on classics, to read the books that inspired the books we’re currently hyping. I found some amazing books because of this and I will definitely try to read more older books in 2019 as well. Because, for one, it led me to The Forgotten Beasts of Eld. First sentence: The wizard Heald coupled with a poor woman once, in the king’s city of Mondor, and she bore a son with one green eye and one black eye. Sybel lives isolated on her mountain, surrounded only be her beloved animals – creatures of myth, collected by her father and grandfather, and now the only friends she has or wants. Until one day, a baby is dropped at her doorstep, and in taking that child in, Sybel discovers her all-too-human emotions because she grows to love the child. This is how this fairy tale of a book begins and while the languages continues to be lyrical, rife with symbolism, and simply beautiful to read, the plot goes into more familiar fantasy territory soon. Tamlorn, Sybel’s adopted son, is not just any child. Away from Sybel’s mountain, two nations are at war. One led by an insecure king, the other by a group of nobles trying to rise up against him. Tamlorn is the king’s son and as such an important piece in their game of power. Although Sybel wants nothing to do with humans and their war, Tamlorn naturally longs to find out more about himself and where he came from. They are both dragged into a war they know nothing of and will each play their part, whether they want to or not. 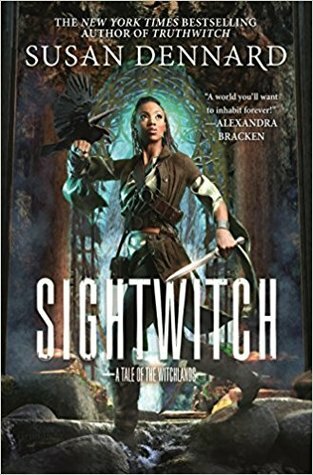 I came to this book knowing nothing beyond the barest premise – a sorceress living with some magical beasts on a mountain – and I think that has made the reading experience even better. McKillip immediately draws you into her world with her poetic language. It’s never too flowery or cheesy, but it hits just the right note of lyrical. Another amazing part of this book is its main character: Sybel, so aloof, so distant, yet so very human at her core, without even realising it herself. Throughout this tale, she learns who she really is and who she wants to be and that alone would have been interesting enough to fill a novel, even without the war and love story and mythical beasts. But, oh, the beasts. While at first, they don’t seem to have too much personality (dragon wants to hoard gold, gets really cranky when not enough gold is there), each of them seems to become more distinct during the story. They are not just mythical creatures with magic powers, they are living, breathing beings with a mind of their own, with a moral compass, with feelings – some of them fond feelings toward Sybel. In the beginning, the eponymous forgotten beasts may only appear like window dressing, like a way for Sybel to demonstrate her power, but they are actually vital to the plot! The Fogotten Beasts of Eld is also a love story, although a very different one than I’m used to from current fantasy books, especially YA. Coren is wonderfully open about his feelings for Sybel and there are no unnecessary obstructions created by misunderstandings or love triangles. Sure, there is a war going on, and Sybel, Tamlorn, as well as her beasts could turn the tide of events, and the fact that Sybel wants to stay out of it all does cause difficulties between her and Coren. But the love story itself, their feelings for each other, are never in question. I can’t say any more about the plot without giving too much away, but let me say that the best parts (plot-wise) of the novel I haven’t even hinted at. This is a quiet sort of book that is much more concernced with the matters inside its characters than with epic battle scenes. But the questions of morality, of using ones power – whether for good or bad (and who’s good and who’s bad anyway?) remain. This is as much a tale about family – found rather than born into – as it is about kings and warriors. It’s an emotional journey through a magical world and I loved every beautifully told page of it. MY RATING: 8,5/10 – Damn excellent! Fantastic review, I really love this one! I read this years ago but I’d love to do a reread, since I’ve completely forgotten everything!